When creating user accounts, you have the option of adding individual users manually, from an authentication source (such as Active Directory), or through a CSV import. When new user accounts are created, you can optionally send a welcome email so that end users receive account information and a link to access the web portal. 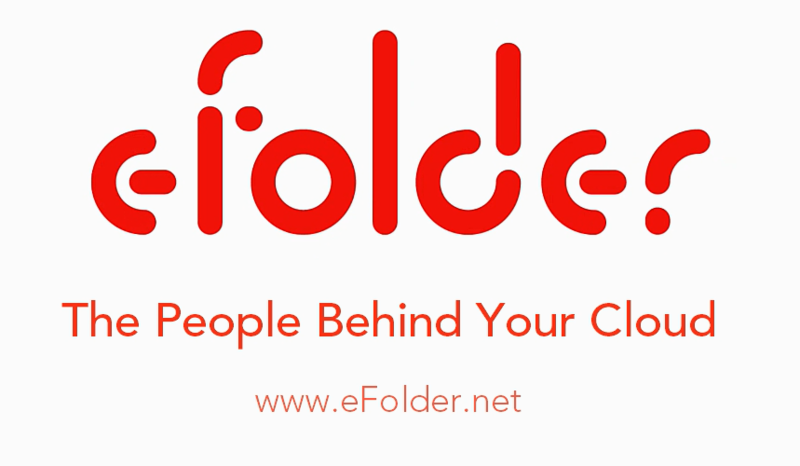 From the web portal dashboard, end users will see files, folders, and any Team Shares to which they have been subscribed. They will also have the ability to download a desktop client to their local machines, and use it to manage and upload files to the cloud. Users can also download and install tablet or smart phone apps—including apps for Android devices, iOS devices, and Windows Phones—to access their files. They also have the ability to view and manage guest accounts, manage backups, view reports, and so forth. In the Last Name field, enter the user’s last name. In the Email field, enter the user’s email address. Each user account must have its own unique email address associated with it. In the Password field, enter password credentials; alternatively, click the Auto-Generate checkbox to allow the system to automatically generate a password for the user. The user will be prompted to change an automatically generated password when he or she first logs in to the web portal. Use the Password Expires field if you would like to generate a time-sensitive password for the new user account. You can select from 6 hours, 12 hours, or 24 hours. If you do not want to generate a time-sensitive password, leave this drop-down field set to Never. In the Mobile Phone Number field, enter the mobile phone number of the user. Click the Shared Quota checkbox if you want the user to be assigned a shared pool of space within the organization. In the Individual Space Quota field, enter a specific quota for the user if he or she is not part of the shared quota pool for the organization. In the Email User When They Reach field, select a percentage checkbox to indicate if a user should be notified when approaching a certain percentage of his or her quota. Select the Send Welcome Email checkbox to send a welcome email to the user. Select the WebDAV Access checkbox to give the user WebDAV access, which is another way for end users to view and edit files. WebDAV is useful when you do not want local copies of large files being stored on external machines. For more information, please reference the End User Guide. 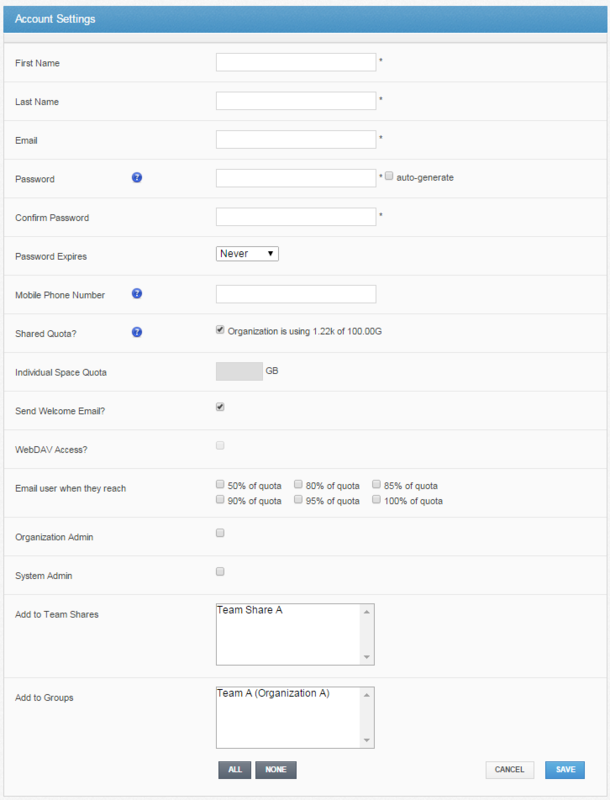 Select the Organization Admin checkbox to give the user administrative privileges. Users should only be given this level of access if they will be conducting administrative tasks within the system. For private cloud systems, select the System Admin checkbox to give the user advanced administrative privileges. Users should only be given this level of access if they will be conducting system-related tasks within the system. In the Add to Team Shares box, select the Team Shares to which the user should be given access, if any. When you use a CSV file, each user account represents one line of the file, and each line contains metadata for one specific user account. You must format each line correctly so that the system can identify the metadata values. The format of each line must be: First Name, Last Name, Email, Quota in gigabytes (0 represents unlimited). 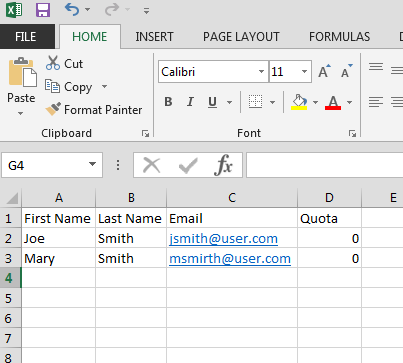 For example, you might start with an Excel file filled with user accounts, and then save the file in CSV format (either MS-DOS or comma delimited CSV format). 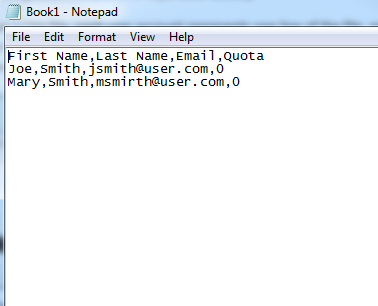 Alternatively, you can start with a text file and save your file in CSV format. Make sure each value is separated by a comma. The first line of your file can serve as the header row, but you must indicate this by clicking the CSV Has a Header Row checkbox when you upload your file. Note: Saving the file in any other format may result in an import error. In the Organization navigation menu, select the organization in which you want to create the new user accounts. The selected organization displays. In the Accounts page, click the CSV Import button. The Create Multiple Accounts page displays. 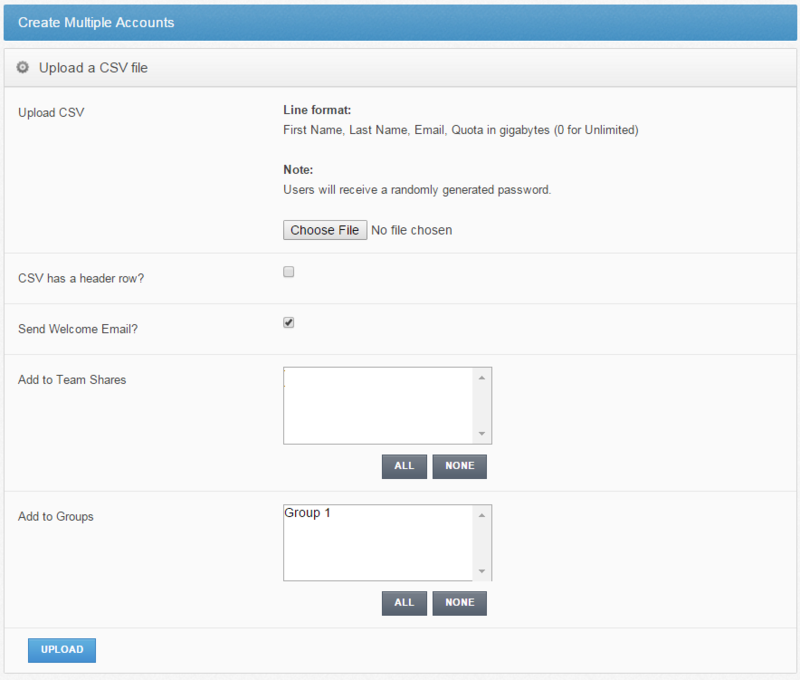 In the Create Multiple Accounts page, upload your CSV file into the system. Click the Choose File button, and select the CSV file from your local machine. Select the CSV Has a Header checkbox if the first line of your file includes header information (formatted as First Name, Last Name, Email, Quota). Select the Send Welcome Email checkbox to send a welcome email to each newly created user account. In the Add to Groups box, select the Groups to which you would like to add the users, if any. Click the Upload button when you are finished. When the CSV file finishes uploading, the Create Multiple Accounts page refreshes, displaying a list of imported accounts. Use this list to confirm that all of your accounts uploaded successfully. An account marked with an Email address already in use message indicates that the email address currently exists in the system. Duplicate accounts will not be imported and the existing record will not be updated. To clear this form and re-upload a new CSV file, click the Reset Form button.